Subject to the Type of Home you live in, your Heating System and a Free Home Survey. You MUST receive one of the qualifying State Benefits, Tax Credits or Allowances. You must receive at least one of these benefits to qualify for a cavity wall insulation grant. If you rent your home you should contact your landlord, your energy supplier and your local authority as other grants may be available. Please confirm that your home is constructed with cavity walls but has no cavity wall insulation installed. To qualify for a grant to help install Cavity Wall Insulation you must receive one of the approved State Benefits, Tax Credits or other allowances. # Child Benefit is subject to maximum household income thresholds based on the number of adults and children living in your home. You must live in your own home. You must receive one of the qualifying State Benefits, Tax Credits or Allowances listed above. Your home must satisfy certain criteria with regard to its type, how many bedrooms it has, how many external walls it has and what type of heating is installed. Your home must be constructed with cavity walls but have no cavity wall insulation installed. 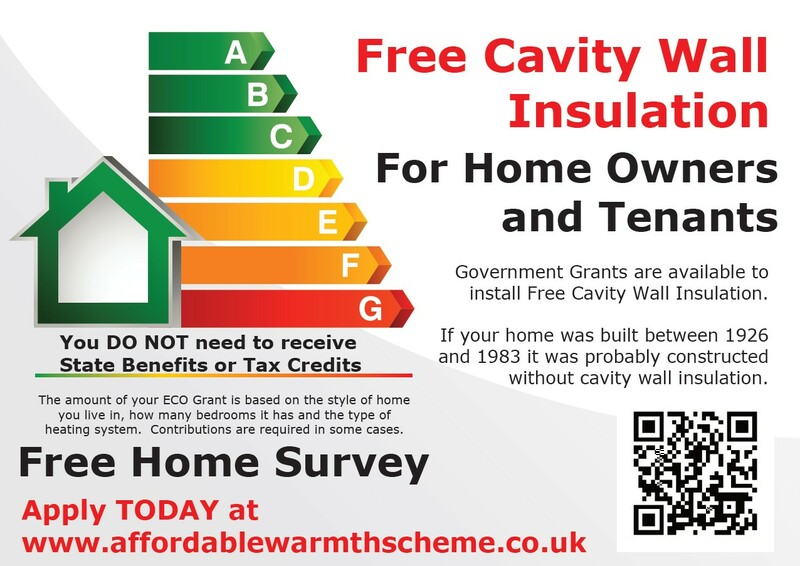 Apply for YOUR Cavity Wall Insulation Grant Today. Free Cavity Wall Insulation may also be available for Private tenants, Council House Tenants and Housing Association Tenants but different rules apply and we only deal with applications from home owners. If you rent your home, you should contact your landlord, your energy supplier or your local authority as other grants may be available. How much does Cavity Wall Insulation Cost? The cost of installing Cavity Wall Insulation depends on the type of property, how large it is and what type of insulating material the installer uses. The following table shows the typical cost of installing Cavity Wall Insulation for each property type. It also shows how much you can expect to save on your heating bills if you have gas central heating. Installing Cavity Wall Insulation in homes with oil or LPG boilers, Electric Storage Heaters or solid fuel heating systems should result in higher annual savings. How do I check whether my home has Cavity Walls? With a cavity wall the bricks are laid ‘end to end’ so that they all the same from outside. The internal and external walls are held together with stainless steel brick ties. With a solid wall there is no, or little cavity between the external brickwork and the internal wall. They are held together by bricks which are laid across the two walls and you can see the ends of these bricks from outside. If your home was originally built without cavity wall insulation it is possible that it has been installed since. You will be able to tell by checking the external brickwork and looking for the mortar-filled holes where the insulation was pumped in. 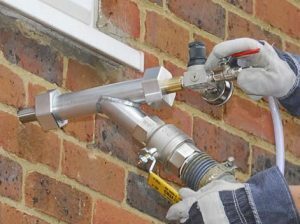 To install cavity wall insulation, small holes have to be drilled into the wall to enable the insulation to be pumped into the cavity and these should be visible. Heat will always be lost from a warm area to a cold area, and in a house without cavity wall insulation around a third of the heat created inside can be lost through the external walls. The vast majority of houses constructed after 1924 have external walls consisting of two layers of brick or block work with a gap, or cavity between them. However, it was not until the 1970’s that cavity wall insulation became widespread and not until the early 1980’s that improved insulation qualities demanded by Building Regulations effectively made it compulsory. The material used in cavity wall insulation fills the gap between the outer and inner skin of the external walls and this helps to reduce heat loss and save energy. By installing cavity wall insulation in a house without any, householders can save over £275 per year in energy bills. (According to the Energy Saving Trust). Are cavity walls better than solid walls? A home built with cavity walls will generally be better insulated and suffer less from condensation than one built with solid walls. Properties constructed with solid walls will still normally have two layers of brick or block but will have little or no cavity between the two skins of brickwork. Most homes in the United Kingdom have exterior walls with a cavity between two skins of brick work or block work and cavity wall insulation fills that gap, which helps to keep in the warmth, saving energy and reducing your energy bills. A registered installer can carry out a boroscope inspection to determine whether your home already has cavity wall insulation. This involves drilling a small hole in the external wall and using a camera to check if the cavity is empty or filled. The material used in cavity wall insulation fills the gap between the outer and inner skin of the external walls and this helps to reduce heat loss and save energy. By installing cavity wall insulation in a house without any, householders could save over £275 per year in energy bills. Is installing cavity wall insulation a DIY job? Installing your free cavity wall insulation is NOT a ‘do it yourself’ job. The installer should be a member of NIA (National Insulation Association) or CIGA (Cavity Insulation Guarantee Agency) and the installation of your free cavity wall insulation should be guaranteed for 25 years by CIGA. In order to insulate the cavity, holes about 22 mm in diameter are drilled through the outer skin of brickwork at 1 metre intervals so that the insulation material can be blown in. The holes should be filled after the cavity has been insulated. The insulating material used is normally mineral wool or foam insulation in the form of beads or granules. But if you have any damp patches on the internal walls, cavity wall insulation should not be installed until the damp problem has been properly resolved. Based on a three bedroom, semi-detached house, your free cavity wall insulation could save around £275 per year on your heating bills.